'History is BORING!' 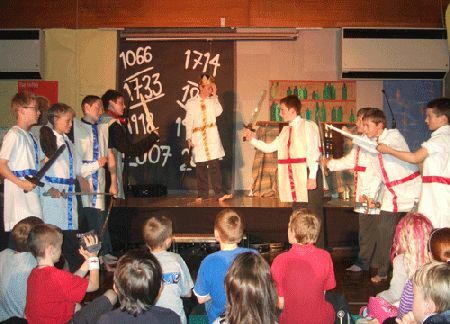 say the children - until suddenly their supply teacher transforms into 'The Keymaster', who holds the keys to history! Going on a magical journey through time, they drop in on a 'big match' in 1066, discover gruesome medical practices in Tudor times and get caught up with 18th century smugglers, the industrial revolution, suffragettes and World War II. The story concludes with a final key - the key to the future. The children see for themselves that today is tomorrow's history, and that changes need to be made. 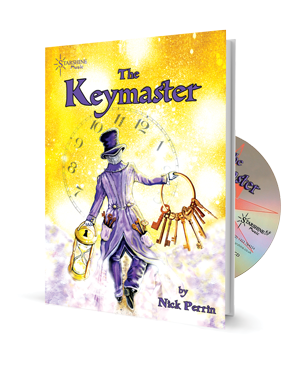 'The Keymaster' is extremely versatile: you can put on the whole show, or pick and mix scenes – or use the simplified narrated version that’s included on the CD. 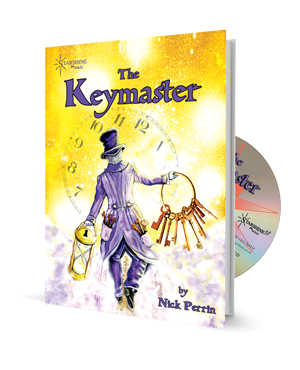 ‘The Keymaster’ doubles as a songbook, with songs on historical themes suited to classroom singing and/or choir use. Music is known to be a great aid to the learning process, making this a very painless way for children to learn about key periods in British history! 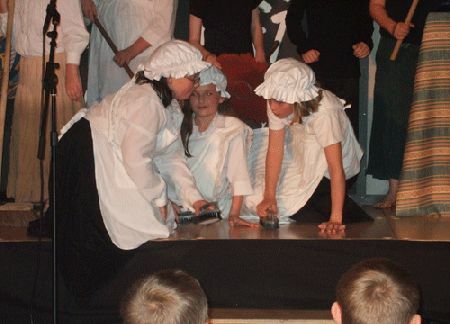 "As a school, we wanted to stage a production that was fun, exciting and above all gave opportunities for the children to learn. The Keymaster allowed us to enjoy all three. The songs were an instant hit with the children and the audience came away singing them as well! Our pupils were interested in exploring the characters and researching the scenes in order to learn more about history. A great way to get children engrossed in Music, History, Literacy and above all ...sustainability and environmental issues!" ~ M Hood, Teacher. 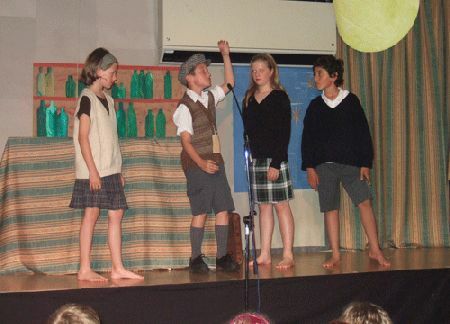 We just performed the Keymaster as our year 6 production and I would like to feedback to you what a fantastic show it was. The songs were brilliant and easy for kids to learn. 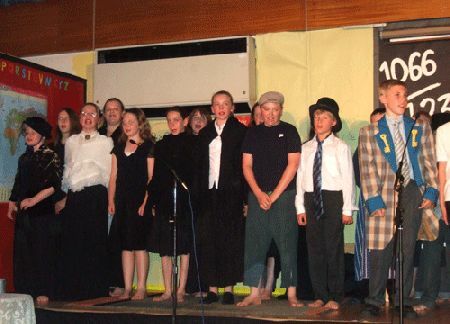 The script allowed everyone to have a part and was written in a thought provoking way which suited the year 6 children as they have the keys to their future now they start secondary school. 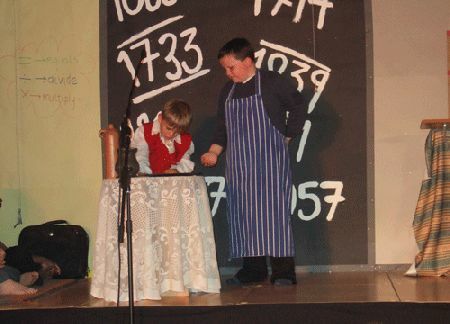 Our headteacher said the show was phenomenal. We have just put on a 2 brilliant productions of 'The Keymaster' which our children loved and are still singing the songs! I played Samantha in the play and I really enjoyed it. I loved all the songs and the funny lines. It is generally a really upbeat musical and I recommend any teachers that want to do a musical that is educational and fun to do as this one is both of those. The songs teach you a lot about the past and it has a great moral - save the world or it won't be here for much longer. 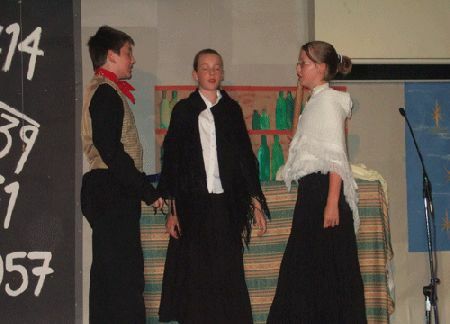 We produced this play with a cast of 54 children from Years 3 and 4. It was a phenomenal success. All the children thoroughly enjoyed the rehearsals and performance due to the play's varied scenes and humour, and its superb music. Feedback from the audiences indicated that this was a highly entertaining piece with fast-flowing action, humour and melody. 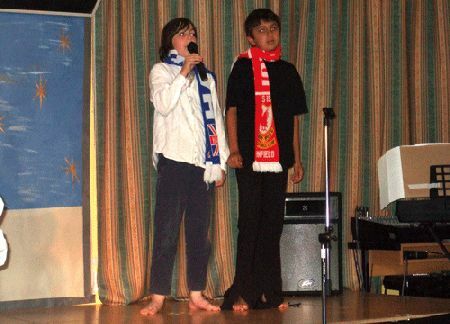 Nick Perrin's musicals are always of the highest calibre and entertaining for both children and adults involved in the production. the keymaster play was great all the songs were fun to sing and the lines were funny. I play the part a suffregete 2 and patient 3, patient 3 dies then gets dragged of the stage wierd but it was very funny, Were still rehersing now with scrips and learning our parts really hard. soon we will know our parts of by heart and derliver a clear performance . im sure will do great on the night at our town hall on the stage. I like all the songs i think there fun to sing even the slower serious ones are fun to sing. its a great play to do and weve have all had a lot of fun i even keep my scrips in my speciel box and i can look back at it and think what a great play it is. A production we will always remember! It is a fabulous play and takes a lot of work but if you do it right it is absolutley brilliant ! 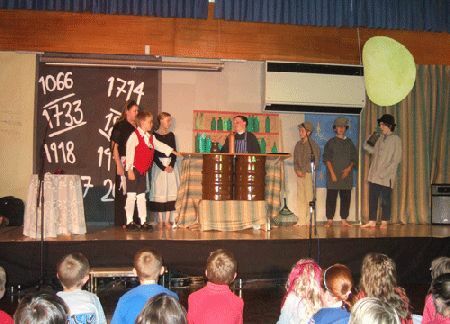 As a school, we wanted to stage a production that was fun, exciting and above all gave opportunities for the children to learn. The Keymaster allowed us to enjoy all three. The songs were an instant hit with the children and the audience came away singing them as well! Our pupils were interested in exploring the characters and researching the scenes in order to learn more about history. A great way to get children engrossed in Music, History, Literacy and above all...sustainability and environmental issues! Very good! Catchy tunes and easy to stage manage. We thoroughly enjoyed the musical and the songs are still ringing in my ears! Review by Judith Colman - Singing Teacher Teacher, East Sussex. Lots of fun, lots of fantastic tunes, lots of learning! 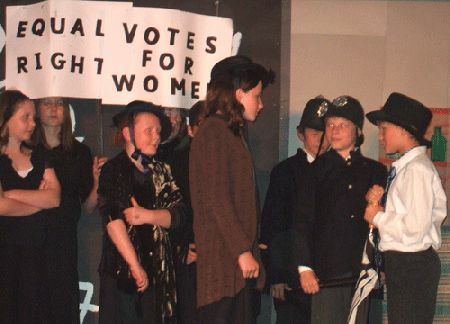 We all loved the music, particularly the different styles, as well as the message that underpins the show. Review by Parent - Somerset. 'The Keymaster' was a fabulous production. It was refreshing to have a new, well-written and humorous musical that was performed so well. Everyone involved excelled themselves and the musical arrangements were fantastic. I didn't stop smiling! The songs were well received by the audience. The show was easy to split between classes. We performed 'The Keymaster' and everyone loved it - the children loved learning the songs and your great service and clearly laid out director's pack made it a stress-free performance for us. For me personally the best aid was your powerpoint of all the lyrics. We had more than 240 children who needed to be taught all the songs - you saved me hours!! Looking forward to learning another great Starshine production! Thank you.